If you’re a shooting enthusiast, you may know the importance of keeping your eye on the target. Your goal is simple – never miss the mark. Using ordinary weapon sights can effortlessly do the job for short-range shooting. However, if you’re dealing with targets several yards away, it simply won’t work. As a veteran in shooting sports, this problem led me to discover a better way to spot targets from afar. Apparently, EOTech sights can help you locate the target and hit the bull’s eye easily. 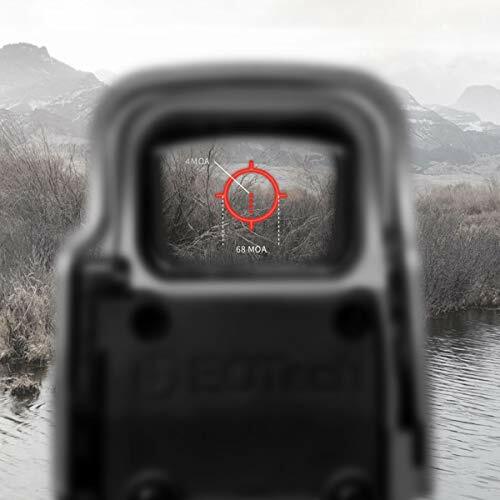 This EOTech review will help you spot the best EOTech weapon sights available in the market. 5.6” x 2” x 2.5"
The first item on our list is the EOTech 512.A65. It’s considered one of the most popular products in this category. In fact, it is on Amazon since 2004. Since then, it earned praises from its users. Its 4.7-star average rating from over 380 reviews is a testament to how satisfied previous customers are. Let us examine further the features of this product. If you want the best close-quarters- combat speed and versatility, this product is for you. It uses a state of the art sighting system with advanced and cheap holographic sight technology. It allows you to see your target clearly. Furthermore, it boosts your accuracy and gives you full control over your shooting environment. Its 1x magnification is enough to amplify your target from a distance. Its sight windows use durable glasses. Finally, it uses ordinary 1.5V AA alkaline batteries. Hence, there’s no reason for you to run out of power. Although this product has remarkable features, there are some downsides of using it. For example, EOTech 512.A65 has no night vision capability. Hence, you can’t use this for night hunting adventures. Another drawback is its fussy sight glass. Apparently, if there's a quick change in temperature, the glass tends to moist. Because of this, it is hard for shooters to see their target. I’m giving this EOTech 512.A65 a 4.5-star rating. It is a quality product that you can always try. Although it would be better if it has night vision capacity, it still serves its purpose during the day. The fact that it only uses AA battery is an added advantage. It allows users to replace it conveniently whenever power runs out. The next item on our list is a specialized version of EOTech 512.A65. Since its introduction on Amazon in 2008, it has been a hot item. In fact, it managed to maintain an average rating of 4.3 stars with close to 80 reviews. It only shows how reliable this product is in the first place. Let's find out how it captured the hearts of its users. Similar to EOTech 512.A65, EOTech 552.A65/1 also uses the best holographic sight. However, this time, this is more suitable for combat. In fact, several agencies like ATF, FBI, and SWAT helped in standardizing it. This product uses rugged aluminum hood assembly for maximum durability. If you’re looking for something that can weather extreme conditions, this is your go-to product. In fact, it is even waterproof for up to 33 feet. Finally, it has the night vision capability making it ideal for a night mission. Just like its predecessor, a 1.5V AA battery is enough to power it up. You might think that this product is perfect. Not quite according to some users with critical reviews about EOTech 552.A65/1. Some customers complain about receiving a bent battery holder. Although this is quite a serious defect, we can consider it as an isolated case. Another concern is on its zeroing capability. Apparently, after using it, it doesn't return to zero setting. As a result, you may need to zero it over and over again before use. EOTech 552.A65/1 is undeniably a quality product that you can rely on. Clearly, EOTech made a lot of improvement on this model. Unlike the older version, this EOTech 512 has night vision and can withstand unforgiving conditions. It makes this product suitable for military and outdoor combat. Hence, it is not surprising why several agencies worked together to standardize this weapon sight. With this in mind, I’m giving this product 4.6 stars. 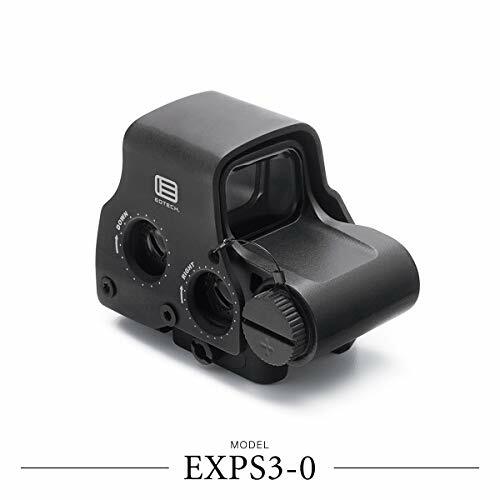 Another item on our best EOTech optics is the EXPS3-0 model. This product promises to help you hit your target right off the bat. It was first introduced in Amazon in 2005. At present, it is enjoying a decent 3.7-star rating from over 50 verified reviews. How did it manage to get this score? Let’s find out why. If you are looking for a parallax free holography, this product is for you. Hence, you can view your target as it is without distortion. Weighing only 317 grams, this product is very handy. Thus, it won’t add too much weight on your rifles. It also uses a shatter-resistant glass for safety reasons. Similar to EOTech 552.A65/1, EXPS3-0 is also waterproof and night vision capable. Finally, laser-precise focus, it has ten brightness settings and 100 yards of the field of view. This feature minimizes the possibility of missing your target. Despite being a quality product, some users note disadvantages in using EXPS3-0. Their collective complaint is receiving a counterfeit product. 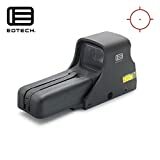 Apparently, due to the popularity of EOTech, there are knock off items sold online. Thus, I strongly recommend buying only from trusted sellers. Another issue is its holographic. Previous clients noticed that it's fuzzy and blurred. This problem completely defeats the purpose of using a weapon sight. There’s a reason why EXPS3-0 landed on our list. It is one of the quality products that avid shooters like you may want to consider. Personally, I love the fact that it is lightweight. Thus, it does not put too much strain on my arms when it is connected to a rifle. Also, they added brightness adjustment, and the wide field of view features beneficial to everyone. Although there are negative comments about its zeroing capability and blurred holographic, this product is still a decent buy. Also, EOTech 512 best price suits your wallet. For this, I’m giving it a rating of 4.2 stars. 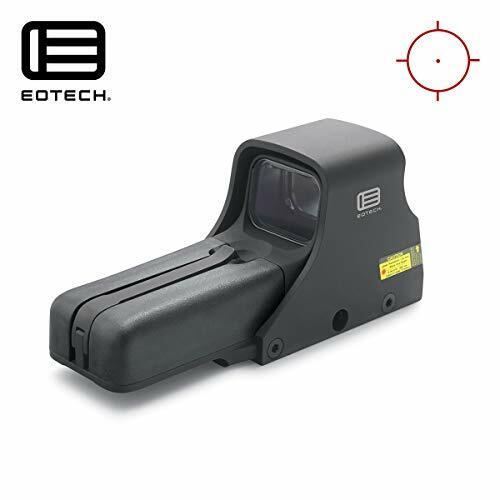 The next item on our list is another quality product from EOTech. 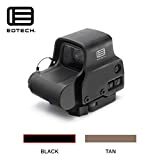 EOTech EXPS3-4 is on Amazon since January of 2011. Since then, it is one of the most sought after weapon sight of EOTech. In fact, it has an overwhelming 4.0-star rating from almost 30 verified reviews. Scroll down to see why most users love it. If you think EXPS3-0 needs a little improvement, get ready for the upgraded version. Compared to other cheap red dot sight, EOTech EXPS3-4 contains a lot of improvements that its predecessor doesn’t have. For example, EOTech transferred all the buttons into strategic locations for easy access. In addition, this particular model is designed to align with .223 caliber ammunition. For better experience during night time, it has night vision capability compatible with Gen I-III. Also, battery holders are now in a separate compartment with quick release lever. Finally, it is also a power saver. In fact, you can use this product for up to 600 hours with brightness level set to 12. Although several customers like this product, some users pointed out weaknesses. For one, they claim that at the lowest brightness setting, the image that you see becomes blurred. As a result, you may need to change the setting so as not to miss your target. Another customer dislikes the fact that this product needs constant calibration. Apparently, you must sight it repeatedly before every use. It's a major inconvenience for some users who want an aim and shoot capability. If you have 0.223 caliber rifle, you may want to consider this product seriously. With all its features, there seems to be no reason for you not to like it. Although there's a slew of critical reviews from dissatisfied customers, the advantages prevail. Hence, I’m giving it 4.4 stars. 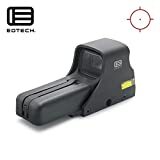 Finally, we have the EOTech G33.STS.BLK. Relative to other products on our list, this is the newest one on Amazon. In fact, it was first posted last March of 2012. Despite being new, it instantly earned the nod of the majority of its users. In fact, it currently has an average rating of 4.7 stars among over 130 verified reviews. 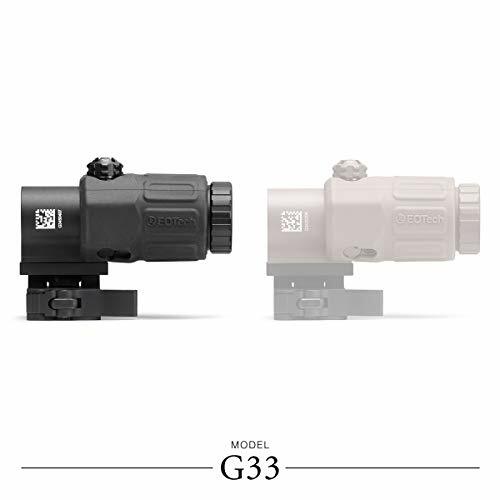 Similar to other EOTech products, EOTech G33.STS.BLK also uses the holographic sight technology. What sets this product apart from the best red dot products is the 2.2-inch eye relief with elevation adjustment. In addition, it has an incredible 7.3-degree field of view. For the convenience of its users, it also includes a quick locking and detaching capability. It weighs approximately 1.3 pounds only. Hence, it will not be a burden to the arms of the users. Finally, to protect the lenses, it comes with dedicated covers. Despite the benefits it offers, there are minor concerns among its users. First, it is a little pricey. Since some customers are price conscious, the price tag becomes a major consideration. Also, its eye relief is quite sensitive. Some users say that you need to place your eyes very close to it to work well. Aside from this, there are no other major concerns for this product. This product is a winner for me. EOTech G33.STS.BLK is simply too good for you not to take advantage of. I love the fact that it is almost a complete package and a modified version of previous units. It is light, compact and portable. Also, its field of view is a major turn on. Although eye relief can be a little better, it’s no big deal for me. In fact, I don’t mind the price if I’m getting a product with this quality. I'm giving this product 4.5 stars. For neophytes, choosing the best one out there is not easy. If you have tried looking online, you can see a wide selection of EOTech magnifiers. At first glance, they may seem to work well for you. However, you must know that not all magnifiers are the same. They serve different purposes. Thus, before buying, you need to know which product suits your purpose. 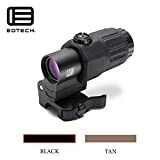 To help you make the smart choice, I have listed the top five EOTech magnifiers on Amazon. Read through the list below and discover every product’s strength and weaknesses. In the end, we will come up with the best of the rest. According to The Truth About Guns, accessories like 512s must be light. Since the weight of your r﻿﻿ifl﻿﻿e may affect your accuracy, you must ensure that any accessory will not add weight. Good Game Hunting says where and for what you will be using the EOTech matters. For example, if you want to go night hunting, you must choose a product with night vision. Similarly, if you will shoot in extreme conditions, you must choose a product that can withstand the weather. In short, select the most suitable product for your needs. Arms Bearing Citizens explains that holographic optics are far better than a red dot. It allows you to find your target quickly. In addition, they have a better field of view which makes locating the target easier. Hence, whether you’re hunting or in a shooting competition, always prefer products with holographic sights. If I were to choose among our options, I prefer the EOTech G33.STS.BLK and EOTech 552.A65/1 Military HOLOGraphic Weapon Sight. Both items can serve your purpose. They are durable, portable, and cost-effective. However, the runaway winner for me is the EOTech 552.A65/1 Military HOLOGraphic Weapon Sight. I like the fact that you can use it for extreme conditions. However, the primary deciding factor for me is multiple law enforcement agencies standardized it. Shooting is indeed an exciting sport that anyone can enjoy. Aside from selecting the best rifle, you must also equip your firearms with the right accessories. Spotting your target from a distance is easier with EOTech 552.A65/1 Military HOLOGraphic Weapon Sight. Take it from me, I’ve used it for the last few years, and it's simply amazing. If you think you don’t have time to do your research, you can take my word for it. I guarantee you will never regret using this product.